Travel Ladakh To Chandigarh from diffrent places Leh Local - Nubra- Pangong- Sarchu- Manali and finaly Chandigharh. These destination you can covered by Car or Bikes. Online Holidays can arrange both for there client with expert guides. In morning after breakfast check out from hotel & drive to airport for board a flight to Leh. On your arrival at Leh airport our representative will meet & greet and transfer you to the Hotel. Welcome drink on arrival. We recommend you completely relax for the rest of the day to enable yourselves to acclimatize to the rarefied air at the high altitude.Dinner at the hotel. Overnight at the hotel. Morning after Breakfast leave for local sightseeing of Leh, visit Leh palace Shanti Stupa and leh market return and Dinner overnight stay in Leh. After breakfast at hotel visit monasteries of Hemis, Thiksey & Shey:- Shey - it was the ancient capital of Ladakh and even after Singge Namgyal built the more imposing palace at Leh, the kings continued to regard Shey, as their real home. 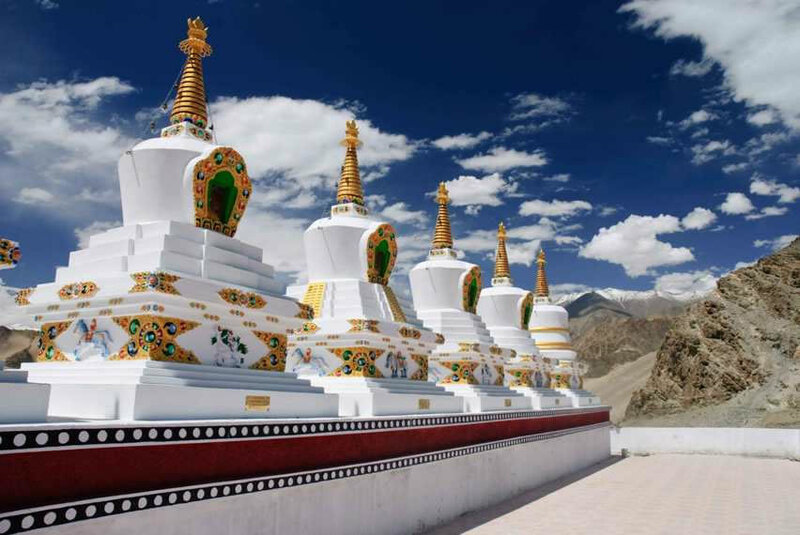 The importance which was attached to Shey - the seat of Ladakh's heartland - is attested by the enormous number of Chorten about the village, particularly around the palace complex and barren plain to the north of the road. Thiksey - is one of the largest and most impressive Gompas. There are several temples in this Gompa containing images, stupas and exquisite wall paintings. It also houses a two - storied statue of Buddha which has the main prayer hall around its shoulder. Hemis - which is dedicated to Padmasambhava, what a visitor can observes a series of scenes in which the lamas, robed in gowns of rich, brightly colored brocade and sporting masks sometimes bizarrely hideous, parade in solemn dance and mime around the huge flag pole in the center of the courtyard to the plaintive melody of the Shawn. Overnight stay at hotel in Leh. After Breakfast at Hotel , we take you to Nubra through Khardungla pass which is the highest motorable pass in the world 5600 mtrs and has been recorded in the Gunnies Book of World Records. At the top enjoy the nature beauty of snow capped mountains. In the late afternoon reach to the camp in Nubra Dinner Overnight at hotel/Camp in Nubra. After early Breakfast leave for Pangong Lake 14,500 ft, through Changla Pass 17,350 ft. (third Highest Motorable road in the world) Arrival at lake, free time at Leisure and enjoy the colour changing lake and the sun on the banks of lake. Dinner and Overnight stay at Pangong Camp. After early Breakfast leave for Sarchu 14,500 ft, through Changla Pass 17,350 ft. (third Highest Motorable road in the world) Arrival at Sarchu, free time at Leisure and enjoy Dinner and Overnight stay at Sarchu Camp. After early Breakfast leave for Manali Visit Kelong enroute the heritage town in Himalaya Arrival at Manali, free time at Leisure and enjoy Dinner and Overnight stay at Manali Hotels. After early Breakfast leave for Local sightseeing in Manali Market Hadimba Temple and Snow point Rafting point return to hotel in manali Dinner and overnight stay at Manali,. After early Breakfast leave for Chandigarh enroute visit Mandi town reach by evening to hotel Dinner and overnight stay at Chandirgh,. After early Breakfast leave for Chandigarh airpiort/Railway Sation to reach onward destination. Placed cover :- Leh – Pangone-Nubra-Sarchu-Manali- Chandighar.